The Dead Sea was geographically formed 3 million years ago when a small fracture occurred amidst the Jordan rift valley. 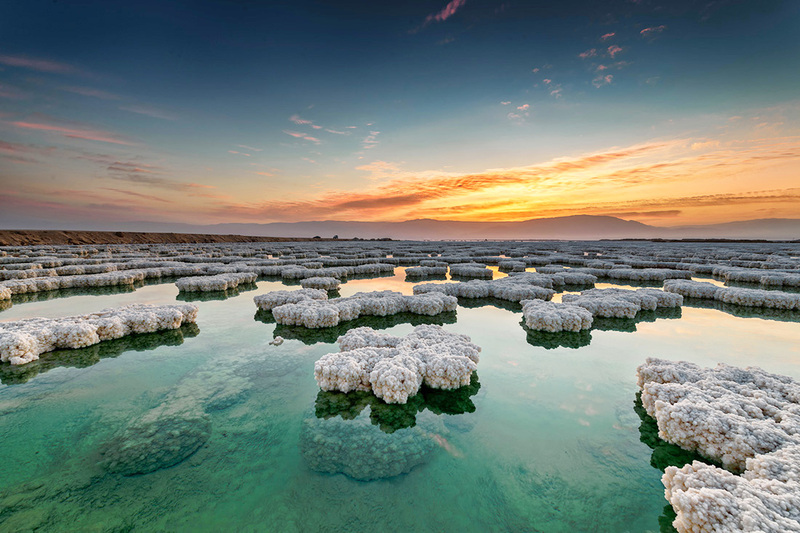 The Dead Sea is situated 400 m below sea level, converting it into the deepest point on earth. Seawater rushed in and was collected in this fracture. The dry climate and high rate of evaporation gradually increased the concentration of minerals in the water. Salt, chalk and gypsum precipitated all along the length of this fracture eventually resulting in a lake-like formation. This lake eventually ended its relationship with the sea to become a landlocked lake. Nowadays, it continues to be fed by the Jordan River and numerous mineral springs that pour into it from the adjoining mountains. What concerns the salts, their quality varies. The further away from the Jordanian side the springs are located, the higher their content of the regularly used kitchen salt (in chemistry abbreviated to NaCl), which is not known to have a great effect in respect to care. It is therefore not surprising that this ancient resort is said to have been frequented by the queen of Sheba and Cleopatra in pursuit of natural beauty and health - “a sound mind in a sound body” as Socrates once stated. The products distributed by BIOSAL® NATURAL COSMETICS are won from the heart of the Jordanian mineral springs area, and have shown to contain the highest possible degree of valuable minerals. Such excellence was recognized in 1992 when our products won the EU´s “GOLDEN TROPHY FOR QUALITY” in recognition of their genuine properties.